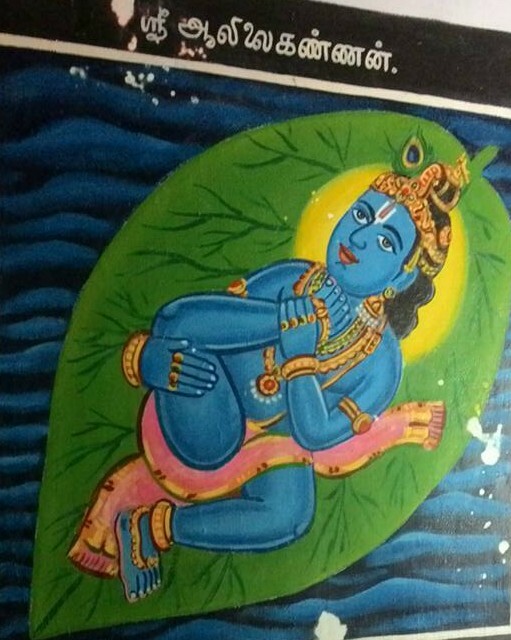 In the seventh pAsuram, AzhwAr is meditating upon the distinguished quality of emperumAn’s acceptance of mArkaNdEya who is a devotee of dhEvathAntharam (other dhEvathA, rudhra) and is to be discarded for that, which is greater than his being Sriya:pathi yet fulfilled the desires of his devotees even by seeking alms. kaNdum theLindhum kaRRAr kaNNaRkAL anRi AvarO? AvarO – will they become? Youthful mArkaNdEya wearing flower garland from which beetles drink honey, was a worshipper of rudhra who considers himself to be the lord, wearing garland which indicates his being the enjoyer and is having having matted hair which indicates his being the upAsaka; at the time of [seeking] salvation, rudhra took mArkaNdEya along with him to mingle with emperumAn who is greater than all; in that situation, emperumAn took mArkaNdEya along, not to separate from him, forever; will those who learned through purANa etc the manner in which it was done, who have visibly seen the greatness of emperumAn over other dhEvathAs, who have acquired clarity as said in “adhikam mE nirE vishNu:” and have the knowledge acquired through distinguished personalities, become the servitor of anyone other than sarvESvara who causes joy? kaNdum theLindhum kaRRAr – (kaRRu – theLindhu – kaNdAr (learn – have clarity – see)) Learning in a disciplined manner from a person (Acharya) and having clarity in that, will ensure that sAkshAthkAram (true visualisation) is attained. SravaNa (hearing), manana (meditation) will naturally lead to true visualisation. kaNNaRku AL anRi AvarO – Will those who are intent on meditating, move away from the real target of such meditation [i.e. emperumAn]? vaNdu uN malar … – Saying “For the salvation of SrI mArkaNdEya who is wearing a garland from which the beetles are drinking honey”; also, should be read as “vAzhu nAL usAch chella” (to spend the remaining time together). The parents of mArkaNdEya decorated him and let him play outside, at that time a voice from the sky announced “he will die soon”, and the parents became very anguished. mArkaNdEya said to his parents “Do not fear, I will take care of this” and went and surrendered to rudhra. rudhra accepted his service until the day when death arrived for mArkaNdEya. rudhra, feeling uneasy about the situation, shut the front doors and the back doors, spread out his matted hair and told mArkaNdEya “Look, I am also in the same situation as you; you saw my garland [and considered me as a dhEvathA], instead of seeing my matted hair [which indicates I am also a upAsaka (one who is praying)]” and further said “as you served for long, you cannot be left in a helpless situation; let me show you the refuge” and took him to sarvESvaran, while sharing emperumAn’s qualities such as saulabhyam (simplicity) etc with him. koNdu angu – Feeling pity in his divine heart thinking “Alas! You came fearing for death!”, not looking down upon him thinking “was he brought along by this prideful person [rudhra]!”, he accepted him as he would accept those who were recommended by pirAtti. Also explained as “nenjil koNdu” (accepting mArkaNdEya in his heart). thannodum koNdu – Fulfilled the purpose he came for and subsequently gave sAmyApaththi (equivalence with him). udan senRadhu uNarndhumE – He took mArkaNdEya along with him just as he took parakAla nAyaki (thirumangai AzhwAr in feminine mood) as explained in periya thirumozhi 3.7 “kaLvan kol“. As said in periya thirumozhi 5.8.4 “pinnai enRum nin thiruvadip piriyA vaNNam eNNiya” (How you thought about keeping me at your divine feet without ever getting separated), not to consider him as a “separate person”, he let mArkaNdEya enjoy the bliss along with him – having this in the mind. Will those who have seen, have clarity and learnt about it, become servitor of anyone other than krishNa? [a nice summary by nampiLLai] Is it so great to lower himself for indhra who surrendered to him? While emperumAn said in SrI bhagavath gIthA 7.14 “mAm Eva yE prapadhyanthE mAyAm EthAm tharanthi thE” (Only those who surrender unto me will cross over this material nature/realm [by my grace]), mArkaNdEya worshipped other dhEvathA [rudhra]. Further, had rudhra as purushakAram (recommendation authority), since emperumAn had the quality of saulabhyam (easy approachability). emperumAn thought “What could he [rudhra] do! instead of abandoning the one who surrendered unto him, at least he showed me and protected mArkaNdEya”. Associating with those who have thamO guNam will lead to abandonment by emperumAn; associating with those who have sathva guNam will lead to acceptance by emperumAn; while this is the case, even while mArkaNdEya approached emperumAn through rudhra [who has thamO guNam], he was uplifted. How amazing! This entry was posted in thiruvAimozhi, thiruvAimozhi 7th centum on September 10, 2018 by Sarathy Thothathri.